Caroll Edwin Spinney has performed Big Bird and Oscar the Grouch on Sesame Street for over 45 years. 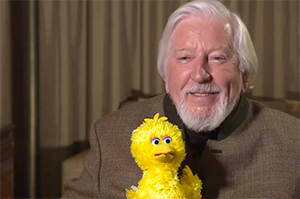 In a 2008 Washington Times article, Spinney said that even though performing Big Bird is physically demanding work, he has no intention of stopping, saying, "I can't imagine willingly walking away from Big Bird and Oscar." He has described his experience as Big Bird as "a lot like growing up to be Mickey Mouse... only taller!" Spinney was born in Waltham, Massachusetts and was an accomplished artist before he started working as a live performer. After graduating from high school in 1951, he attended The Art Institute of Boston's College of Art & Design. While in the military, he created a comic strip under the name Ed Spinney. In the early 1960s, he created an animated cartoon series called Crazy Crayon under the same name. In 1955, Spinney headed to Las Vegas, Nevada, where he created the show Rascal Rabbit. He returned to Boston in 1958, appearing in the summer series The Judy and Goggle Show as a puppeteer opposite Judy Valentine, performing Goggle the bird. When Judy and Goggle was moved out of its slot for station WHDH-TV's returning programming, both Spinney and Valentine were offered a berth on the Boston broadcast of Bozo's Big Top in 1959. Spinney played a variety of hand-puppet creations, usually in one-off skits, and also played Bozo's grandmother Grandma Nellie (in full clown-make-up) and several recurring costumed characters. These included Flip-Flop the Rag Doll, Kookie Kangaroo (a failed boxer), and Mr. Lion, "the fastest draw alive." The latter role combined Spinney's performing and cartoonist skills, creating quick sketches for the kids. In the 1960s, Spinney created two puppet cats, Picklepuss and Pop, who he performed in various venues, including stage shows and some Bozo broadcasts. Picklepuss and Pop would later go on to perform with the Muppets just once, in the 1988 Jim Henson play-along video Wow, You're a Cartoonist!. In 1969, Spinney met Jim Henson at the Puppeteers' of America Festival at Kingsbury Hall in Salt Lake City, following an ambitious experimental presentation (hosted by Picklepuss), which combined different live-puppetry techniques with film projections. The show went awry due to various technical issues and other problems, but afterwards, Henson told him that he "liked what you were trying to do." Henson then asked Spinney if he wanted to work with him on a new children's show being developed. Spinney went on to star as the man behind Big Bird and Oscar the Grouch. As Big Bird, Spinney traveled the world -- in the TV specials Big Bird in China and Big Bird in Japan, and in special Sesame Street episodes that took him to New Mexico and Hawaii. He has also starred in a feature film, Follow That Bird. Spinney has guest starred as his characters on many other programs, including The Flip Wilson Show, Scrubs, Mister Rogers' Neighborhood, 1 vs 100, The Muppet Show, and over 141 episodes of Hollywood Squares. Spinney wrote a 2003 autobiography titled The Wisdom of Big Bird (and the Dark Genius of Oscar the Grouch): Lessons from a Life in Feathers. Caroll Spinney also wrote and illustrated How to Be a Grouch, a 1976 picture book that explains the world from Oscar's point of view. Spinney also drew the picture of Mr. Hooper that Big Bird drew after Mr. Hooper died, and designed one of his characters, Bruno the Trashman. His artwork was featured in a 2010/2011 exhibit at ToonSeum. A documentary about Spinney titled I Am Big Bird premiered in 2014, chronicling the life of Spinney and his wife Debra.